13",2008, Russet colored alpaca body, arms and legs, black and white alpaca face and head. Tan wool felt trousers, maroon wool felt vest with wood buttons,dark brown wool jacket and a flower print tie. Tan shoes complete his outfit. 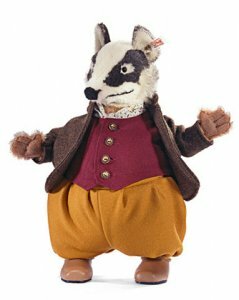 He is a short, bristly, fat, waddling badger...a favorite character from the Beatrix Potter stories. Fully jointed and will stand alone.